This is our custom-built 5 pin XLR-F to dual 3 pin XLR-M top quality 2 channel Mogami cable (2 sends configuration). You won't find a nicer snake anywhere. Construction is Neutrik XLRs with Mogami 2944 individual cable, one white for left, one red for right with braided sleeving down the length of the cable to the fanout. Neutrik connectors are some of the best connectors around, with no screws to fall out after years of abuse. Mogami wire is (as far as I'm concerned) the best wire, used in the best studios for its ultimate sound qualities and durability. Mogami 2944 cable is very flexible, durable, light-weight cable with a similar design as the channels in the Mogami snake cables. 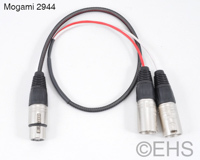 This is a cable for stereo or dual elements microphones that use a 5 pin XLR Female for output. Standard pinout is 1 Gnd, 2 L+, 3 L-, 4 R+, 5 R-. If your gear differs from normal, please let us know. This is a top quality cable to replace the manufacturer provided cable. Works with mics like Audio-Technica AE2500, BP4025, AT8022, Shure VP88, Royer Labs SF-12, Beyerdynamic MCE82, and much more. Braided sleeving from the 5 pin XLR down the length leaving a 5"-6" fanout (more by request). Shrink color master is the shrink at the braid to fanout transition.